In Tribute to Marty & Denali Schmidt | Doris S. Michaels Literary Agency, Inc. It is with deep sadness that I write to inform you of the passing of Denali and Marty on K2. Though considered by the climbing community to be some of the world’s most respected mountaineers, the mountain’s powerful conditions do not discriminate. As Marty would say, “The mountain chooses your path.” Though Marty described K2 as magical and majestic, the mountain decided to make it their final resting place as they were taken by an avalanche while sleeping together in their tent at camp 3 during the night of July 26. Marty could not help but express his pride in his son as Denali led the way on their climb with skill beyond his age. Denali was so happy to be by his side, sharing their passion for climbing together as a father-son team. Every time Denali called he was overflowing with the beauty he had experienced there. A memorial service celebrating their lives will be held at Bear Valley Lodge on Sunday August 11th at 2 p.m. All are welcome. Food will be provided and lodging is available at the Bear Valley Lodge 209 753 2327 and the Bear Valley Real Estate 209 753 2334 will have houses and condos available. There will also be lots of room with friends and to camp. Denali loved the color blue, please wear some for him, and red for Marty as well. Denali’s family is asking for everyone who would like to, to contribute a story, memory, or thought about one or both of them – maybe an an experience you had, a way they have affected your life, a funny (or serious) story, or anything you would like to eternalize in their memory. Photos, links, and videos are also welcome. What is contributed by Friday, August 9th will be on display at the service. A book will also be available for your handwritten stories and messages. Everything will be immortalized in a collection that will be made available to Denali and Marty’s family, friends and anyone interested in celebrating and remembering their special lives. Please email all contributions to Larisa at this email that has been set up: denalimarty@gmail.com. Larisa and friends will also be creating a slideshow for both Marty and Denali so please also send any photos you would like to be included. No one was more passionate about life than Denali and Marty. 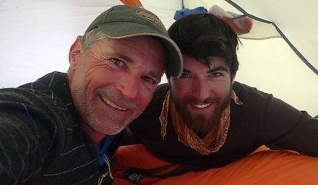 As Sarah Wilson, a fellow adventurer, mentions in her tribute to them, “this tragedy reminds us that we only have today to live and love, to inspire others and to have the adventure of our lives – as both Marty and his son Denali did.” Denali and Marty would have wanted us to channel our heartache into passion for life and love for each other. The world has lost two special souls whose light must be carried on through us all.